Last week, the Denver Metropolitan Commercial Association of REALTORS® (DMCAR), in conjunction with the Denver Business Journal, honored its top commercial real estate producers of 2013 in land, industrial, multi-family, office, investment, retail, and small office broker categories at the association’s annual Heavy Hitters Awards. 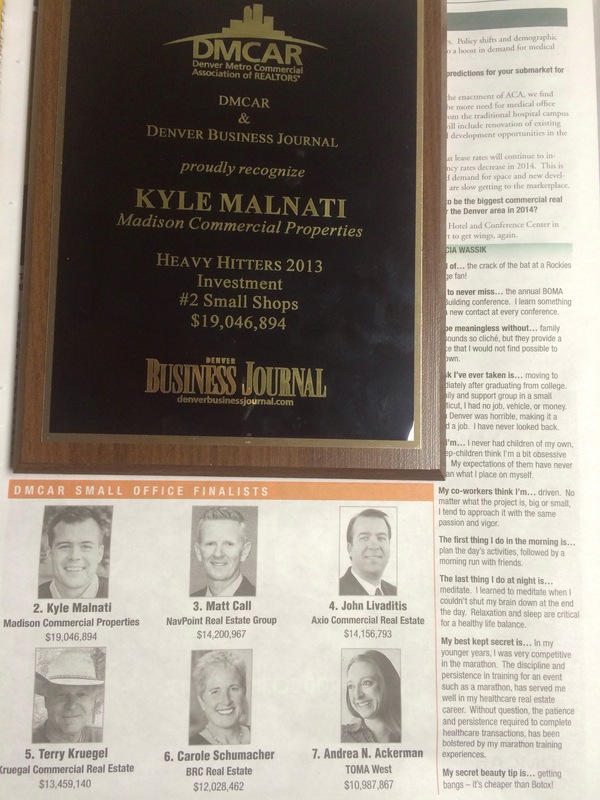 Kyle Malnati was DMCAR’s #2 broker in the “Small Office” category. The award is based on sales volume for a given year, and Kyle’s proportionate sales production in 2013 was $19,046,894. This was the second year in a row that Kyle got 2nd place in the “Small Office” category; his sales production in 2012 was $15,711,609. Founded in 1994, the Denver Metropolitan Commercial Association of REALTORS® represents approximately 2000 commercial REALTORS® in the Denver metropolitan area and is the largest commercial REALTOR® association in the country. The term REALTOR® is a registered collective membership mark that identifies a real estate professional who is a member of the National Association of REALTORS® and subscribes to its strict Code of Ethics.